Distributor: Currently available streaming on Viki, but also on Animesols. Notes: That's not a typo, Sanrio actually partially funded this film. This probably explains why Bagi is a badass pink catgirl. Bagi has also been romanized as "Baghi" (as in Bagheera) and, hilariously, Baggy. Deep in the South American jungle, a Japanese hunter named Ishigami Ryosuke is hired to hunt a ferocious monster that has been terrorizing the villagers. The truth is that he is very familiar with Baghi ... for she is a bioengineered cat-woman, and Ryosuke remembers when she was just a kitten who started showing human traits. But over the course of years, things go horribly awry, and now Ryosuke must steel himself to end Baghi's journey once and for all. It's sometimes a bit hard watching Tezuka Osamu's movies. You feel compelled to respect the work, as Tezuka is generally a skilled storyteller, but his work is often hampered by archaic art direction and heavy-handed moralism. Bagi suffers from enough of each to be a frustrating watch. Like Barefoot Gen, the character designs are simply too simplistic and cartoony for us to really accept what's happening onscreen or take it seriously. Which is odd because Bagi is a movie that deals quite directly with the issue of cloning and genetic manipulation, like The Island of Dr. Moreau, or Jurassic Park (complete with bizarre DNA explanation mini-cartoon, though it should be said that in this instance, Bagi came first). Of course, when they reveal the "great horrible experiment", it turns out to be Bagi, a badass pink catgirl. (Actually, she's not half housecat, she's half mountain lion. Which doesn't explain why she can snap things in half with her tail, but hey, that's genetic manipulation for you.) We also find out that the person responsible for a lot of this is Ryosuke's own mother, herself a geneticist. Eventually, Ryosuke ends up proclaiming his desire to "take her home and have her act like a real mother". This is, of course, about the time you realize this will all end horribly tragically. Still, before we get there, we still have to muddle through misadventures involving a motorcycle gang, a South American jungle half-ripped straight out of the opening of Raiders of the Lost Ark and half mixed up with a desert from an old western film, and not one, but two genetics labs filled with mad scientists and the evil industrialists who fund them, one of them named (and I am not making this up) the Cucaracha Research Lab. There's also the hilarious assertion that cacti have supernatural powers, something that really amuses us back here in Arizona. The art and animation are somewhat frustrating to discuss. This is definitely older material, but unlike Nausicaa, the art and animation in Bagi has not aged well. Part of the problem is in the character design work itself -- Tezuka's work is already "old school" by the time this film was made, being a product of the 1950s and 1960s. We never understand why Ryosuke has this squiggly on his left cheek (it's not a scar, it's not hair, what IS the squiggly), and the "villains" are so obvious as to look stupid. It really distracts from the fact that this is intended to be a serious film, and the only character that has decent character design and animation is Bagi. And as for Bagi herself ... she's a furry's dream. 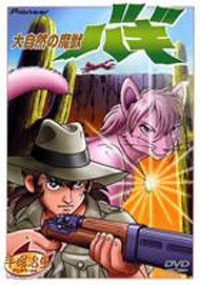 For a Tezuka film, there really is an inordinate and simply disturbing degree of fanservice (think Minerva Mink here). She spends half the movie naked (granted, she's half animal so this is never explicit) and the other half in tight red clothes. Ironically, it only feels like fanservice when she's clothed. To their credit, the creators of this film actually treat Bagi with some degree of seriousness, as a victim of science and circumstance, and Shimazu Saeko (ironically, mad scientist and anti-catgirl antagonist Natsume Akiko in Cat Girl Nuku Nuku) really sells the role, any but hints at a romantic relationship between Ryosuke and Bagi feel misguided and awkward -- less because she's a catgirl, more because Ryo partially raised her. In fact, the whole film often feels awkward and ham-handed, as if it's trying to tell a serious story, but is held back by archaic norms of early 1980s cartoon storytelling, like one-dimensional bad guys, and even the inclusion of a child sidekick named Chico. Bagi is actually Tezuka's direct critique of the Japanese government's approval of recombinant DNA research, but unfortunately, the whole issue clearly is painted as an issue of black and white, and not given a nuanced, balanced treatment, as opposed to, say, Bagi herself, who clearly deserves a better movie, or even a television series. There are elements of a good film in here, and at times, Bagi is a sad, but beautiful film about one trapped between the natural and human worlds. I almost wonder how this would fare if rewritten and redesigned for sophisticated modern audiences, because this topic really does deserve serious treatment, and we really should give this movie for at least making the attempt to treat anthropomorphic characters as more than just cartoons. This movie also seems to have inspired the initial upsurge in popularity of catgirls as a concept in anime, so take from that what you will. Either way, Bagi is interesting, but ultimately unspectacular and a bit disappointing. I'll bet it was pretty cool in 1984, though. Recommended Audience: There is some violence. Technically, Baghi spends the majority of this film naked, but what's strange is that it only feels like fanservice when she's clothed.